The RIDE TO CONQUER CRPS has begun! This page will be updated daily with new RIDE information. Show your support by donating to the RIDE! PRE-DEPARTURE: JULY 18 WITH OUR RIDE SPONSORS. 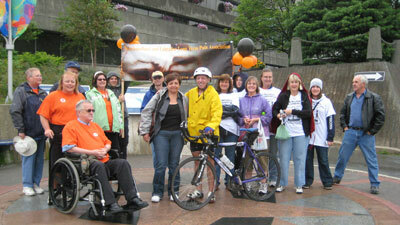 SHOW YOUR SUPPORT FOR THE RIDE TO CONQUER CRPS! please CLICK HERE or view cities below. Updates on the route will appear as they are received. inclement weather may change the dates. If the RIDE route changes, items will be posted in GREEN as soon as possible. As the RIDE reaches each city, the city will turn BLUE. Aug 4 rain delay due to winds and gale in Port. Unable to ride to Corner Brook today. Will start off again Tuesday Aug 5th for Corner Brook NL. The RIDE BLOG is updated in the evenings. JULY 18-19: Dr. and Mrs. Shulman leave Thornhill to travel to Marathon, Ontario(1,088 km) to begin the RIDE TO CONQUER CRPS. We thank Mrs Shulman who drives the support SUV. Stay safe! 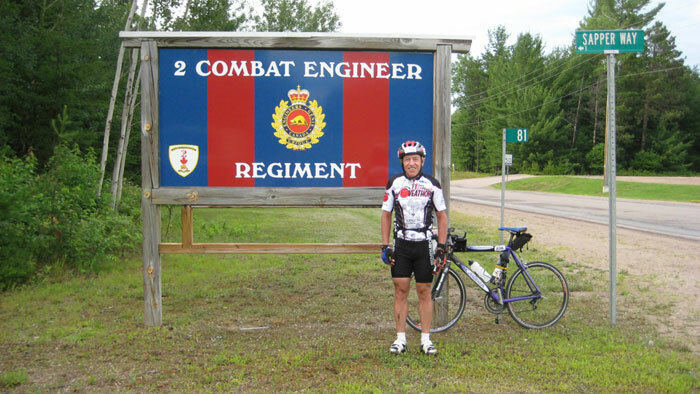 JULY 20: THE RIDE TO CONQUER CRPS 2008 begins! At 9 AM the RIDE departs from the Marathon, Ontario town sign(see photo below).. The ride has started. Ahouva and I were delighted to start our ride from Marathon today. We even had a little sunshine for the pictures and I set off across the Canadian shield into the land of granite and jack pines. The Trans Canada highway was under construction and presented some problems. After 54 kilometers I had my first flat of the ride. As I stopped to replace the tire I was eaten alive by black flies. I met Ahouva for lunch at White River. Then the rain started and was with me for the rest of the day. At one point there was a downpour with hail and high winds. Luckily I was able to find some shelter and wait it out. From there on it was a wet ride but great fun. I arrived in Wawa at 6 pm after a ride of 185 km. This is a bit longer than the Tour de France stage 15 that ran today at 183 kilometers. They may have finished their stage a little faster than I did. I was able to overcome some obstacles and reach my objective. Obstacles are not new to people living with chronic pain and they also know how to persevere and overcome these. I am inspired by their perseverance and will continue this ride for them. Wawa is named after the Ojibway word for wild goose. To emphasize this and prove that the town was not named by a toddler, the town has at least three gigantic goose statues. It is the jumping off point for trips to the “world’s largest game preserve” the Chapleau Crown Game Preserve. 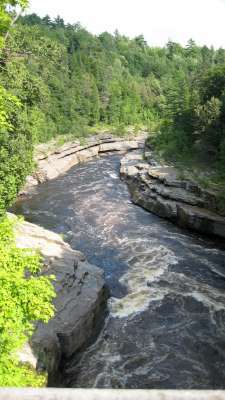 Just south of Wawa is an impressive waterfall where the Magpie River, 38 meters across, falls 23 meters before emptying into Lake Superior. Worth a visit. Tomorrow we will ride to Sault Ste. Marie, 225 kilometers by Hwy 17. We considered riding down Hwy 129, but this turned out to be a ‘haunted highway’. More about that later. I set out from Wawa in the rain and rode into the Lake Superior Provincial Park, one of the most impressive parks in our province. The road winds near the shoreline with craggy granite outcroppings on the left and on the right Lake Superior, dark and brooding under the rainclouds. The road repeatedly ascends to great heights and then descends rapidly directly towards the Lake. At the last minute the road veers away to drivers’ great relief. This brinkmanship is decidedly more worrisome to the rider of a bicycle hurtling downwards, in the rain. I am happy to report that I made it around every corner without mishap. This roller coaster continued on from Wawa to Sault Ste. Marie 225 kilometers. This was one of my more memorable days. Ahouva in the van played leap frog with me and was always there to help out. Ahouva was able to explore and even went looking for petroglyphs. We stopped 2 hours for breaks and lunch over our 11 hours on the road. I was in the saddle for almost 9 hours, and this works out to an average speed of 25 km/hour, and maximum speed was 65.5 km/hour in one barely controlled descent. It has taken Ahouva and I four days to ride the entire route around Lake Superior (two days this year and 2 days last year). I find North of Superior to be spectacularly beautiful, but unforgiving. Ahouva was afraid to wander far away from the highway in her search for petroglyphs. I also had the impression that a misstep here could be disastrous. Perhaps this is due to the appearance of Lake Superior. Cold and uninviting. The lake was formed in a rift valley, the mid-continent rift, when the North American continent was riven as part of continental drift. The bottom of the lake is the lowest point in North America. There was volcanic activity at its depths, and many basaltic formations are seen protruding from below. I could easily see these from the shore. These are a hazard to navigation and, along with the severe winter storms, are responsible for many shipwrecks. The most famous shipwreck is the SS Edmund Fitzgerald that sank in 1975. The legend that Superior never gives up its dead is probably true. It is clear to me that humankind inhabits this area at the indulgence of Mother Nature. It is with mixed feelings that we leave this area and head eastward to tamer geography. We will ride towards Sudbury and see how far we get. I estimate another 200 plus kilometer day, putting us near Massey. After the roller coaster ride yesterday I was stiff and sore all over. It’s difficult to sleep with muscle pains. I know what you’re thinking, “He’s just finding this out now?” I did sleep in a bit and had a late start. The skies were overcast but it was quite pleasant. As I rode east of Sault Ste. Marie I passed a dilapidated shed overgrown with weeds. On the side of the shed was a very good reproduction of a Group of Seven painting, (see photo below) reminding me that this is Algoma where the G of 7 produced some of their best landscapes. I was delighted to find the reproduction in this odd setting but couldn’t appreciate it for long since the mosquitoes were appreciating me. The road east was flat and very pleasant, reminding me of the prairies. There were Mennonites in their horse drawn carts and bales of wheat in the fields. In Bruce Mines I caught up with two riders who turned out to be Renato D’Alessandro and his friend Brian who were riding from Vancouver to Halifax to raise funds for the Canadian Paraplegic Association. I knew that they were doing this ride but I didn’t expect to see them on the trail. We all had a snack with Ahouva at Iron Bridge. Later I caught up with yet another rider, Ramesh Ferris who is hand cycling across Canada to raise funds for Rotary International’s polio eradication program. "What are the chances of all four of us nutbars, oops, I mean visionaries meeting all on the same day? " So in one day we had good weather, beautiful scenery, wonderful support and good companionship. Could I ask for anything more? I rode on until Massey, 210 kilometers from the Soo. All of these cross Canada expeditions require on the road support. Renato and Brian have a friend in Renato’s RV leapfrogging them. Ramesh has 3 staff and two camper vans following him for the seven months of his odyssey. I have a most remarkable supporter, my wife Ahouva, who is constantly attentive and helpful. I could not do this trip without her. All the accompanying members of all our teams worry for us about the food and lodgings, gear transport and storage, navigation and communications. All our support vehicles have some sort of sign on the back warning drivers of a cyclist ahead. This leaves us free to ride the distances necessary to get to wherever we are going. This is a team effort. I am profoundly grateful to Ahouva for all her efforts to support my ride. I am also impressed with my friends from PARC. Helen Small has been supporting the ride in her energetic and dedicated way. She has taken on this project from its conception almost a year ago and has produced remarkable results with her imaginative approach to communication and fund raising. She knows how to get the message out that people with CRPS require the same support, advocacy and research that people with higher profile diseases seem to have. 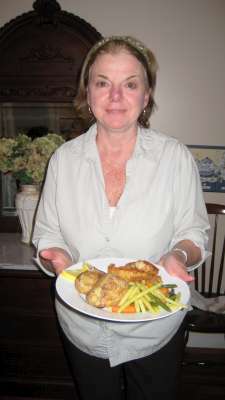 Helen is the voice of CRPS in Canada. My thanks also to her dedicated volunteer staff including Deanna, Willy, Rose and Violette. I have enjoyed working with you over this last year. Tomorrow I am back on the road to North Bay, with a quick look at Sudbury over my left shoulder as I pass by. Another beautiful day here in the near north. Clear blue skies and moderate temperature, but somehow it managed to rain while the sun was shining. I had a very good ride from Massey to North Bay with a stop in Sudbury for lunch and a short stop at Sturgeon Falls to see the falls. Ahouva followed in the van and handed out PARC pamphlets. Her listeners began to open their wallets but she told them they should donate through the web site. We rode/drove 225 km from Massey to North Bay, where we watched the sun set over Lake Nipissing. Could there ever be a better vacation? The north shore of Lake Huron, called the North Channel has a large First Nation population. The people are descended from the Ojibwa nation and comprise many communities, the Pic, Mississauga, Serpent River and the Sagamok Anishnawbek First Nations to name a few. The communities seem basic but have all the necessities, and the people are very pleasant. They appear as if they’ve seen many moons. I spoke to one old fellow from the Sagamok who looked about 80 years old. He said to me, “You are awfully old to be doing this aren’t you? I’m 57 and you are even older than I am.” I tried not to look surprised. He was right, of course. Tomorrow we leave for the Ottawa Valley and should reach Pembroke. Once there I can set in motion Plan B. Now this is just between you and me and should not be revealed to anyone else. I intend to throw the bike onto a big tire and then push it into the Ottawa River and jump on. Then I can nibble fresh Ottawa Valley apples and get a tan while I drift down to Ottawa. Can you keep this a secret? Well, Plan B was a complete failure. Who could believe there are so many rocks in the Ottawa River? And white water. It’s a good thing I had on my helmet. So it’s back to the road on the bike. Today was another stormy day with rain on and off, and thunder and lightning in the distance. As I rode through Mattawa it became quite cold and I looked forward to climbing the monster hill south of the town just to warm up. Eventually the rain stopped and we continued on through Deep River, then Chaulk River, then Petawawa and finally stopped for the night in Pembroke. The distance for this soggy ride was 211 km. In Petawawa we visited the Canadian Forces Base which has been training our “warriors” since 1905.It is also the site of the first military plane flight, the Silver Dart, in 1909. I wanted to visit the base since it was here that my father trained with the Royal Canadian Engineers and then was sent overseas to fight in the Italian and European campaigns in WW II. He was wounded in action and then decorated. My mother also worked at CFB Petawawa as a civilian during the war. I try to imagine what it must have been like at the camp with infantry and artillery training side by side. The engineers learned how to construct bridges quickly so the troops could ford the rivers as they chased the retreating Axis forces. Also training there were the soldiers of the Special Service Force, a combined American and Canadian Unit. At any given time during WW II 20,000 soldiers were training at CFB Petawawa. Also on the base were POW’s from 30 different countries but mostly German and Italian. The base must have been chaotic, the parade ground always full with sweaty, dusty recruits following orders barked at them from bad tempered sergeants. Somehow the troops trained and then went overseas and got the job done. These men and women, my parents included, are Canadian heroes. Tomorrow it is a short ride on the Trans Canada Highway and then we will cross over to the Quebec side of the river. This is our last full day in Ontario. Time to sum up. As always, the ride today started in the rain. I would be surprised by anything else. The skies quickly cleared and we had a hot, sunny day as our last day in Ontario. We rode/drove over the bridge at Portage-du-for a tiny Quebec village with a huge church. Just being in la belle province cheered us up. The road now continued southwards through farmland between the Ottawa River and the Laurentians. The air was clear and dry with the scents of the farm. Quebec is charming with its small villages each dominated by its church, and the good humour of the locals. We had lunch at Quyon where the ferry crosses the river, usually empty. We went through Aylmer, Hull and Gatineau with a short break at the Museum of Civilization. South of Hull there is a bike path that alternates between the riverside and by Highway 148 as a marked bike path which is paved and broad. Ideal. We went as far as Montebello, for a total of 225 kilometers. A perfect ride. Montebello is a town of 1039 but it has a reputation that far exceeds small towns. It was first settled by Louis Joseph Papineau and his Manoir is now a national historical site. 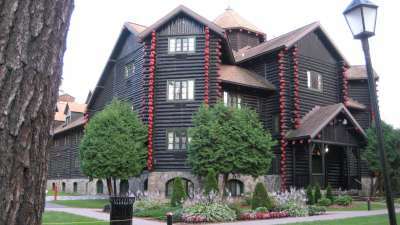 Montebello is better known for the Château Montebello resort, the largest log structure ever built. It is quite impressive and I photographed it to the obvious displeasure of the staff. It has been the meeting place of world leaders. The resort was the host for the 1983 NATO Nuclear Planning Group, the 1981 G7 Economic Summit, and the meeting of the George W. Bush, Stephen Harper, and the President of Mexico, Felipe Calderón one year ago. I think all this notoriety has gone to their heads. As expected the price of lodging is exorbitant. The people we met in Montebello are pretentious and haughty. Now that is so much in character that it almost has a charm of its own. Part of a trip to Quebec includes being snubbed. Without it the trip is not complete. After all, if I want good service I can get it in Toronto. Tomorrow we move on eastward and will try to keep as far north of Montreal as we can. As you can see, I try to avoid big cities. If all goes well we will be in Trois Rivieres tomorrow night. We started out from Montebello without rain, but that was soon to change. Within an hour the rain started and was off and on all day. There were lightning bolts and thunder to the north, but far enough away that we did not stop. The road rose gently into the foothills of the Laurentians but never gained much elevation and was not a roller coaster. 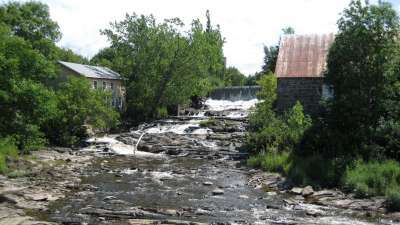 We passed through the villages of Lachute, Saint Jerome, Saint Lin Laurentides, where Sir Wilfred Laurier was born and grew up, Joliette, and Louisville and arrived at Trois-Rivières near dark when the rain was getting serious. After we were safely indoors, the lightning and thunder started again, much closer this time and we were fortunate to be inside. The trip from Montebello to Trois-Rivières was on beautiful paved shoulders for the 227 kilometers. I did an extra 8 or so kilometers for fun. OK, I admit it. I lost the highway. At least Ahouva can’t laugh at me. She was lost also. Quebec is a cyclist’s paradise. The route from Hull to here is about 300 km of bicycle lane. The highways 138, 148 and 158 are beautiful, flat and well suited to biking. There are lots of trails to follow off road leading north from these highways. Many of the hotels advertise “cyclists welcome” and many B & B’s offer use of their bicycles to guests. Je vais retourner. Trois-Rivières is a pleasant city that is the second oldest in the province, founded in 1634 as a fort and fur trading center. The three rivers are actually three tributaries of the St Maurice River. Before flowing toward Trois-Rivières, the St. Lawrence River widens out to Lac St. Pierre which is a UNESCO Biosphere Reserve. It is an important stopping point for hundreds of thousands of migrating waterfowl including herons. I didn’t see any herons nesting, but there were dozens of kite surfers on the lake. The 1500 km or so of the trip so far have been rough on the wheels. I have to constantly clean and oil the bike. Just before Trois-Rivières the cassette came loose and I could only ride in low gear. I arrived at the city tired and haggard, soaking wet, and pedaling at about 140 per minute, appearing decidedly demonic to passersby. The cassette is now perfect and we are ready to set off for the next stop, Quebec City. This will be a short day since I have to prepare for the conference tomorrow in Montreal. This was our second day without rain and it was a beautiful day. The riverside route is the Chemin Roy, the King’s Highway. It passes through many picturesque towns with breathtaking views of the Saint Lawrence. We passed through Champlain, and Batiscan and had lunch on the banks of the Ste. Anne River, which brings clear, cold water down from Mt. Ste. Anne. The road then took us through the villages of St. Charles-des-Grondines, Deschambault and Cap-Sante. At Donnaconna a detour from the highway led us to rolling farmland and then down to the Rivière Jacques Cartier cascading through a high walled gorge. The climb up out of the gorge on the bike was challenging and then we rejoined the highway for the last few kilometers into Quebec City. This was a short day with only 142 kilometers from Trois Rivières to Quebec City. We finished early enough to stroll through the old city of Quebec. 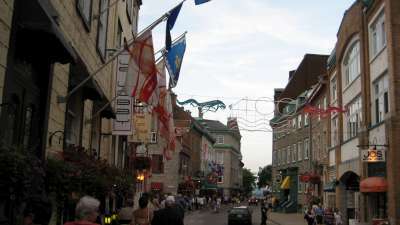 Quebec City celebrated its 400th year since its founding by Samuel de Champlain on July 3, 1608 and the celebration is still in full swing. The old city is alive with bright banners and flags draped over the stone buildings and crossing high over the cobblestone streets. There are buskers and street artists everywhere, caricaturists, face painters and horse-drawn carts. It’s a lively scene. On both sides of the kilometer long Grand Allee sit hundreds of people in dozens of cafes sipping whatever it is they sip, watching the passing parade. There are bicycles everywhere with sometimes two or three riding on one bike. You cannot be here without feeling relaxed and having fun. Old Quebec City is surrounded by stone walls and fortifications, reminding us that it was a town in need of defense. Despite its position on the banks of the Saint Lawrence and despite its walls and ramparts it was captured quickly by British General James Wolfe in 1759 when his troops scaled the hill behind the walls and surprised the French troops under General Louis-Joseph Montcalm. 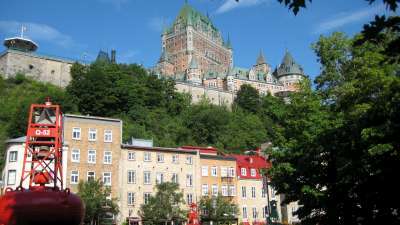 The battle took only 20 minutes and Quebec City has been part of the British colonies and then the Canadian federation since. Despite this history that has fed separatist feelings, we saw no sign that the Quebecoise consider this a humiliation. In fact they use this history as an attraction, daily re-enacting the battle in full battle dress on the Plains of Abraham for the enjoyment of tourists. They call this Just ‘Plain’ Fun. This is a remarkable example of national reconciliation that should be of interest to other cities with internal divisions, such as Beirut, which is a sister city to Quebec City. The bike lane has continued now for over 340 km from Hull to Quebec City. Today it was crowded with bikes and riders were smiling and waving at each other. I have a feeling that it will not continue to the south shore of the Saint Lawrence where we will ride on Tuesday towards Rivière du Loup. This may be a challenging ride into a sparsely settled area. That will be day 10 since day 9 will be the conference day. 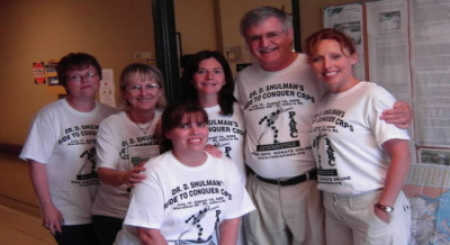 Dr Shulman will give a lecture on the "Clinical Picture of CRPS ." Well, I was wrong. Highway 132 from Quebec City to Rivière du Loup is excellent for the most part and this area is full of activity. We departed Quebec City and had a beautiful view of the old city and especially the Chateau Frontenac from the ferry to Levis. The road is flat and pleasant with sweeping views of the Saint Lawrence on the left and fields of corn and wheat on the right. Artisans’ shops appear on both sides of the road near the villages and beautiful wooden sculptures outside the shops announce the shops’ contents. We rode/drove through the villages of Berthier-sur-mer, Montmagny, Cap-St-Ignace, L’Islet and St. Jean-Port-Joli and were impressed with the numbers of shoppers and the carnival atmosphere. In L’Islet lapstrake wooden fishing boats are produced in the traditional way. North of these villages the road becomes poor in places and the farming settlements are farther apart. Finally we arrived at Kamouraska which is legendary in French Canadian culture. It has been the backdrop to at least three Canadian feature films, the best known of which is the 1973 film ‘Kamouraska’ and starring Geneviève Bujold based on a novel by Anne Hébert and translated into seven languages. The other two films shot here are ‘Cormoran’ and ‘La Petite Seduction’. All three films were shot on location in houses that are still standing. The name Kamouraska means, “Where the rushes grow on the edge of the water”, and has also been used as a label for a brand of guitars and a vodka. It is my impression that much of Quebec culture is centered in small villages. We continued on to Rivière-du-Loup for our last night in Quebec. Our distance today was 216km in alternating bright sunshine and heavy rain. Rivière-du-Loup is a pleasant city with a charming old town. The Saint Lawrence here widens considerably and is tidal, with large mud flats exposed at low tide. Where tributaries flow into the Saint Lawrence such as the Rivière-du-Loup there are abundant krill and other whale snacks and whale watching is popular. Whales from the small beluga to the enormous blue whales can be seen. We didn't take time to see them this trip. I was honoured to be one of the speakers at a conference organized by Dr. Gary Bennett who is a professor and Canada Senior Research Chair at McGill University and is studying CRPS. Also speaking were Dr. Bennett, Dr. Terence J. Coderre, and Dr. Magali Millecamps. I believe that we are fortunate to have such gifted researchers with an interest in CRPS. Although progress is slow, there are some new and exciting developments in CRPS research that may ultimately result in better treatment. 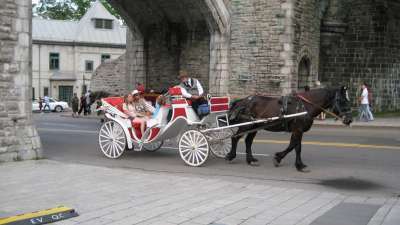 For this reason Helen Small and PARC have decided to give some of the donations from this ride to McGIll University to fund continuing research. If you suffer from CRPS, please feel confident that there are many talented people trying to help you. You are not alone. This is our last day in Quebec and therefore the time has come to sum up. Least bike-friendly There are no nominations in this category. New Brunswick, can you match that? Our third rainless day of the trip and it was beautiful weather. I set out late from Rivière-du-Loup and made good time despite the rolling hills all the way to the New Brunswick border. We passed many hillside villages including Whitworth, Cabano, Notre-Dame-du-Lac and Saint-Louis-de-Ha!-Ha! I did not make this up. We ate lunch in Edmunston, New Brunswick four hours after setting out. 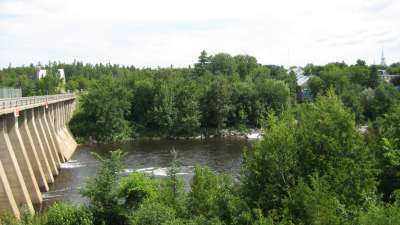 Here the Madawaska River flows into the St. Johns River forming a self-satisfied river that is not in any hurry to go anywhere. Here we left the Trans Canada Highway for the pleasant Highway 144 that accompanies the lazy St. Johns. In Grand Falls everything changes. The river becomes a torrent, throwing itself at a succession of rocks as if angry to be disturbed. It falls 75 feet over the horseshoe shaped cataract to the canyon below where it bubbles between high canyon walls. Then it widens out, calms down and resumes its limpid way as if nothing happened. Grand Falls does more than just irritate the river. It has a large McCain’s frozen food plant which produces 10 tons of French fries each hour. We arrived in Grand Falls with much energy but realized that we lost an hour at the border and it was now evening. Rather than try to squeeze out a few more kilometers before dark, we decided to just watch the falls, photograph each other and have an early dinner. Our day was disappointing with 186 km from Rivière-du-Loup to Grand Falls. We will try to put in a longer day tomorrow. I would like to thank all of you who have written emails of support to us. We read these daily and we do take great courage from your messages. Unfortunately I have not had time to answer anyone. Please don’t feel slighted. I will answer all emails when we return home. One message was interesting and I repeat it here. “By the way, you probably knew that 'Snow Cake' (the movie) was recently filmed in Wawa. Sigourney Weaver played in this movie. Sigourney plays an autistic adult who lives in Wawa. Interesting movie.” I didn’t know that. I should have spent more time there. Tomorrow we will try to reach Miramichi via Highway 108. It is a deserted highway running through lands owned by Irving, the oil baron. The two commodities that seem to run New Brunswick are McCain’s fries and Irving Oil. I wonder if there is a connection. As I departed Grand Falls there was thick fog, reminding us that we are in the Maritimes. Fortunately the fog burned off and we even had a peak at the sun. But only a peak. Within two hours it clouded over. We took the back road to Plaster Rock and then took Highway 108 towards Miramichi. Can a highway be haunted? Malicious? As soon as we started to ride our cell phones lost service. Not to worry, we have walkie-talkies. There were no side roads, no houses and no signs. Only New Brunswick forest. Then my GPS beeped that it could not get a lock on satellites. Creepy. We noticed there were very few cars going by, despite the well paved highway. Did I say well paved? That ended at 85 km and the road turned to gravel. Then the rain started sometimes quite heavy. The gravel became mush. As I was trying to get through the mush the road popped my rear tire. You’d think the renegade road was trying to make me turn back. At that moment, Ahouva appeared. The road relented. The rain stopped briefly and we changed the rear wheel, got over the mush to the paved section and rode to the end of the defeated but still perilous path. As a parting shot 108 sent a thunder and lightning storm to soak me and ruin all my electronics. But we made it to Miramichi and here we are drying out. Grand Falls to Miramichi, 206 wet kilometers on the haunted highway. If you need more evidence of the peculiarity of the Highway 108 area, let me point out that this is a seismically unstable area. On January 9, 1982 a double earthquake of magnitude 5.7 and 5.1 was felt with the epicenter just north of the roadway in question. The shocks were felt as far away as New York City and Ottawa. Aftershocks continued daily for three months. Earthquakes also occurred in this area in February 1855, October 1869, March 1904 and July 1922. I guess we were lucky to get out with our lives. This area is part of the original Acadia, settled by French families in the 17th century. They were friends with the M’kmaq Indians and remained neutral in the conflicts between the French and the English. When the area was ceded by the French to the English in 1713, the British demanded the Acadians pledge allegiance to Britain but they refused, preferring to remain neutral. In 1754 the British governor expelled the Acadians (le Grand Dérangement) and they dispersed, some to Louisiana where they became known as the Cajuns. 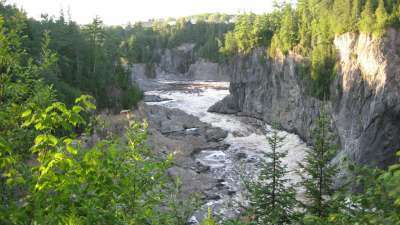 Many Acadians returned to New Brunswick, settling in the north-west, above Grand Falls since the British ships could not pass the falls to search for them. Contemporary Acadians adopted French culture and do not seem to have much in common with the Cajuns, preferring poutine to jumbalaya. July 28 each year is the day of commemoration of le Grand Dérangement. Today there are storm warnings for this area but this intrepid expedition will set out. We will try to get to Amherst or vicinity. Let’s see how this goes. We awoke to rain storms in Miramichi and a weather warning that there would be heavy rainfall to the west. We set out with some trepidation, but as we cycled/drove east the skies cleared. This reminds me of Farley Mowat’s The Boat That Wouldn’t Float. Every time he headed his boat westward there were storms but when he turned her eastward the skies cleared. We had a beautiful day and the brisk east wind brought the scent of the beach and salt water. This easterly was a head wind which was more work for me. At Kouchibouguac we first saw the Northumberland Strait and P.E.I. 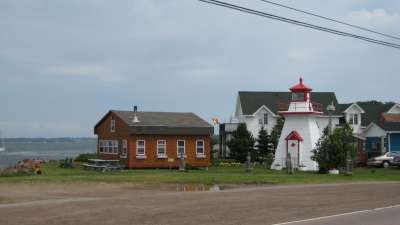 We left Highway 11 and went down the side roads to visit St. Louis de Kent, Richibucto, Rexton, Buctouche and Cocagne. In these Acadian towns every house and business had the Acadian flag flying. Trucks went down the streets loaded with lobster traps, and there were signs on restaurants and kiosks advertising clams and chips, fresh scallops and lobster rolls. There were tents set up in every village square in preparation for the festivities on Acadia Day on August 15. 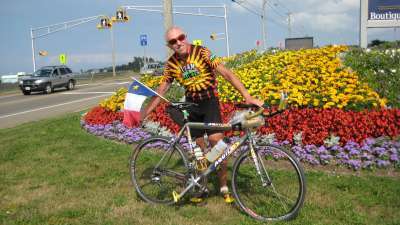 I participated in my small way by putting the Acadian flag on my bike. We stopped for lunch at Shediac, the “Lobster Capital of the World”. Lobster stocks have dwindled in the Northumberland Strait and eating a lobster in Shediac does not ensure that it was trapped near here. After leaving Shediac we followed side roads to Cap Pelee and Port Elgin and then crossed over into Nova Scotia to the “Sunrise Trail”. A Short drive down this road brought us to Tidnish, population 250. We are here in a very pleasant B&B for the night. The distance from Miramichi to Tidnish by the van’s odometer was 210 km. Lobsters are usually prepared for the table by dropping the live animal in boiling water. This practice is acceptable to those who maintain that crustaceans cannot feel pain since their nervous system is primitive. However the lobster shows a violent reaction to the boiling water and others interpret this as a reaction to pain. In fact lobsters have opiate receptors just as do vertebrates. Chronic pain patients know that the opiate receptor is the site of action of Morphine on nerves. It is also the site of action of our body’s natural Morphine-like substances, the endogenous opioids. Having opiate receptors implies that the animal has its own endogenous opioids to relieve pain, and therefore the animal must feel pain. Furthermore giving crustaceans Morphine modifies their response to painful stimuli depending on the dose, and use of Naloxone will cancel out this effect, just as it does in vertebrates. All these observations put together suggest that lobsters do feel pain, and feeling pain has survival value for the individual and for the species. We should be looking at more humane ways to kill lobsters. Tomorrow we will continue on the Sunrise Trail to the area of New Glasgow. We are in Scottish country now and better get used to lots of names that end in “nish” and “borough”. We awoke to a brisk east wind blowing in from the Atlantic. As if the strong headwind wasn’t enough, the rain started shortly after getting underway, and lasted all day. At some times it became severe with rain pelting my face. I had a flat tire which I was able to repair in the Wallace Museum. We passed through Pugwash, Port Howe, Tatamagouch, River John and Caribou River all on the “Sunrise Trail”. I have to admit I didn’t see much of any of them due to the rain and mist and the struggle against the wind. Ahouva and finally met and had a break at Pictou. We then went on through New Glasgow including a stop at a bicycle shop where I had some repairs done. We then rejoined the Trans Canada for a hilly and chilly ride to Antigonish where we are staying for the night. This was a slow day and in my 9 ½ hours in the saddle I only covered 194 km or 20 km per hour. We reached our destination and that is all that matters. People here do not forget their roots. This is a Scottish town as we quickly learned from the giant statue of a kilted Scot wielding an axe at the entrance to the city. Many of the signs are in English and Gaelic, such as the sign for the James River reading “Bahrain Sheumais”. I hope I got that right. The dairy supplier here is Scotsburn. Bumper stickers tell us to “Honk if you’re Scottish”. Everything here is Scottish except the soap. It’s Irish Spring. Tomorrow we are on to North Sydney. I hope the weather improves. (left to right) Velda, Helen, Jennifer, Dr Pollett, Lynette, Wendy (below) Helen with Northside General Pain Clinic Staff who gave a grand welcome on Dr Shulman's arrival Aug 3. Dr Shulman arrived at 7 PM in North Sydney NS, riding up the hill to the hospital after a 12 hour day of riding. He was greeted enthusiastically by Dr Pollett and ushered inside. On the fifth floor, he was escorted down the hall to Dr Pollett's clinic by several waiting CRPS patients to the tune of "THEME FROM ROCKY". DADADAA Tatataa Tata TAA tatata...At first he could not be seen, but the seas suddenly parted and Dr Shulman, gave a ROCKY salute and a big smile!!!! Applause!!!! Everyone cheered as he guided his bike down the hall! He toured the clinic with Dr Pollett who introduced his staff, (see photo) explained his clinic treatments and showed thermograms of a recent patient who had photon treatment and was doing well. Patients asked him questions and gave him a warm Cape Breton welcome! My personal warmest thanks to the staff at Northside for all their efforts, their fine hospitality and unwavering support! You people are grrrreeeaaat! Today he is on the way to Corner Brook taking care to check the wind speeds at Wreck House, where it is the highest average wind velocity in the world, which can blow trains off tracks. See you in NFLD Dr Shulman! helen will be in St John's for a rousing reception on Aug 8. Our first day in Newfoundland was not very successful. We took the overnight ferry, the MV Caribou, from North Sydney to Port-aux-Basques and on getting off the ferry we realized there is a serious storm here. The winds are gale force from the north-east and the rain is horizontal. The sea is in turmoil. Each wave batters the bare rocks of the shore with a roar. Walking near the shore the rain tastes salty, mixed with spray whipped off the crest of the waves. The winds predicted for the Wreck House are 70 to 100 kph. Somehow this is appropriate for Newfoundland. People here are taking this in their stride, shopping, walking around, visiting. One toothless fellow said to me, “Nice day”, and I think he meant it. I haven’t pedaled at all today and we will look at the conditions tomorrow. We have had a chance to see Port-aux-Basques and it is a rugged outport with population of 4600 hearty souls. 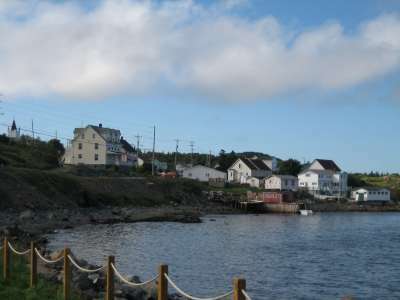 It was described as a good harbour by Samuel de Champlain in 1612. Basque, French and Mi’kmaq fisherman and whalers used it as a safe, ice-free port even before 1700. Captain James Cook also explored and charted Port-aux-Basques. 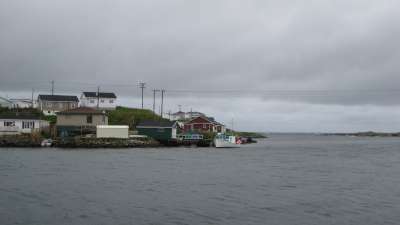 The fishery and the ferry service employ the residents since Newfoundland became Canada’s 10th province in 1949. Even after the collapse of the cod fishery, fishers catch perch, herring , mackerel and capelin and the Seafreez plant here processes them. My appreciation for Newfoundlanders has grown since coming here. They showed patience and good humour on the ferry trip across the Cabot Strait. Reservations for the ferry are full months ahead of each sailing, and last minute trips to or from “the rock” are possible only by arriving well ahead of the sailing and waiting for a cancellation in a long line of vehicles. The MV Caribou itself is pleasant enough if you come prepared with pillow, blankets and food. Everyone lay down to sleep after turning off the lights by unscrewing the bulbs. In the morning all 1200 passengers left the ship and headed straight to the one coffee shop open at that hour, Timmies on the Trans Canada, and waited patiently. 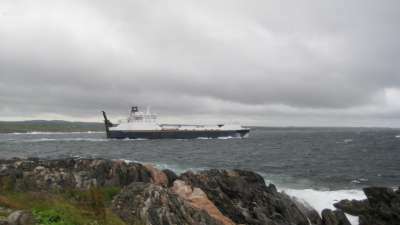 The ferries carry most of the goods needed by Newfoundlanders and also most of the exports from the island. One of the largest, the MV Caribou was named after its predecessor, the SS Caribou which provided this service for decades. However at 2:40 am on October 14, 1942 as she was 60 km out of Port-aux-Basques the German submarine U-69 torpedoed and sunk her with the loss of almost all on board. It’s easy to see why Newfoundlanders are so patient and respectful of their ferry service. Tomorrow we will set out for Cornerbrook if at all possible. Wish us luck. We left Port-aux-Basques with a headwind of 30 kph. Strangely, the wind seemed to decrease in the Wreck House to 15 kph. We didn’t see any rail cars blown over. I guess this was our lucky day, or else the legend of the Wreck House is a bit exaggerated. The day was spent riding against a moderate headwind with constant rain falling from very dark clouds. Newfoundland is considerably colder than the mainland and I was wearing three layers and was still cold. The road was hilly and became mountainous and it was a long ride to Corner Brook. I rode 11 hours and it was almost dark when I reached Corner Brook, 218 km from Port-aux-Basques. I didn’t see any of the communities along the way due to the mist and rain and could not take photographs. Corner Brook is located in the Long Range Mountains, which are a continuation of the Appalachian Mountain belt. The high climbs, mountain passes and frightening descents continue north to Deer Lake where I will be riding tomorrow. These mountains are a challenge to cyclists and as a result numerous international competitions are scheduled here including the International Triathlon Union World Cup events almost yearly. I expect a shorter but more difficult day to Springate. Today was also a rainy day off and on but between rain squalls the sky looked brighter and the pavement dried off. It has been some time since I rode on dry pavement. The ride went well despite the head winds blowing down the Humber Valley. We could appreciate the scenery and there were many beautiful views of the Humber Arm, Deer Lake, Sandy Lake, Birchy Lake, Halls Bay and Crooked Lake. The area is hilly but not mountainous as it was before Corner Brook. In the last 60 km I was riding south so the headwinds became tailwinds and I was able to ride more quickly. We arrived at Badger (20 km west of Grand Falls-Windsor) at sunset after riding 230 km in 11 ¼ hours. This puts us within 450 km of St. John’s. Today we passed by the road to Baie Verte, an outport on the north shore. When I was a medical student I did my elective in Baie Verte Hospital. At that time there was no road and all movement of people and goods was by coastal ferry. It’s too bad that I don’t have time to visit and see how the road has changed Baie Verte. We are presently staying at a charming B&B which is a converted nunnery in Badger and we also ate supper here. We had cod with all the trimmings and for dessert partridgeberries. I find Newfoundlanders prefer cod to salmon. Some of the best salmon rivers are in the Badger area, including the Badger, Red Indian and Exploits Rivers, and the Humber Arm. Salmon is a tastier and healthier fish and can be prepared in many ways. Cod is served fried since it is otherwise very bland. Then why is cod preferred by the locals? The cod fishery was the stimulus to settle Newfoundland in the early 1500’s and many outports were founded as sites for cod salting and drying on drying racks or flakes. The inshore fishery developed the technology to fish for cod such as handlining, longlining and jigging, the trawl and the cod trap. Cod was featured on the stamps of Newfoundland since 1880. At that time over 90% of the adult male population of Newfoundland was occupied in the cod fishery. It was a devastating blow to the island when in 1992 John C. Crosbie, Minister of Fisheries and Oceans, announced a 2 year moratorium on cod fishing and this was extended indefinitely in 1994. Locally cod is plentiful despite the moratorium since Newfoundlanders are allowed to fish for personal use. I think preference for cod over salmon is cultural and traditional. Tomorrow we set out for the area of the Terra Nova National Park. I’m not sure of our exact destination which depends, as always, on the weather. 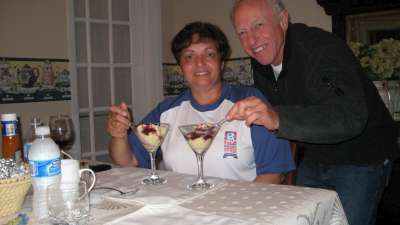 We started our day with a very big B&B breakfast including Partridgeberry jam. This berry grows only in Newfoundland and inSweden and is sweet and delicious. Also a specialty of Newfoundland is the bake apple or cloud berry and its jam has a subtle apricot flavour. Once again the ride started this am with rain and contrary winds. I was delayed further by a side trip to the “Bike Doctor”, a bike mechanic who sold me some parts, in Grand Falls-Windsor. His was the only bike shop in the town. He operates out of his garage which is a warehouse of used bicycle parts piled up with no obvious system. He pulled the required parts out of the confusion and this was all I needed. This highlights the lack of bicycle services in Newfoundland. There are no bike paths in the cities I have gone through and no bike lanes. The only interurban road is the Trans Canada which has paved shoulders but is not a pleasant place to ride. I have not seen any other cyclists in Newfoundland, although this could also be due to the stormy weather of the last week. Perhaps St. John’s has better services for cyclists. I rode the hilly and challenging route from Badger to the visitor center of Terra Nova National Park, 201 km in 10 hours. Near the end of this trip I attempted to enjoy the sweeping views of Bonavista Bay but was greatly hindered by the heavy rain. Today was our best day of this tour with sunshine, magnificent scenery and more of the legendary Newfoundland charm. I started my ride at the spot on the TCH in the Terra Nova National Park where I stopped yesterday. The park is hilly enough to be interesting and there were frequent views of Clode Sound on the left. Salmon rivers bubbled and gurgled under the highway on their way to Clode Sound and some had fences spanning their width to prevent salmon from going farther upstream. I’m told this is a conservation measure. After the Park the highway remaining hilly, with an exceptionally big hill as the TCH entered the Avalon Peninsula. As I paused to catch my breath at the top of the hill, I caught the impressive vista of Conception Bay and I imagined I could see all the way to St John’s. Exhilarated, I knew this was the high point of land and it would be downhill to the sea. As I rode to our B&B cars and trucks gave me a short honk and a wave as they have throughout this province. 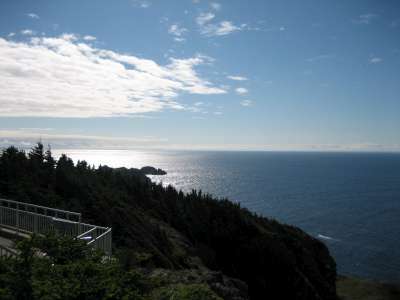 Our immaculate B&B by the sea is in Avondale, about 40 km from St. John’s. The motto of our hostess is, “no one should leave this table hungry”. Terra Nova to Avondale is a ride of 208 km in 10 ¼ hours. Here’s Adi. For the first time, in my adult life, I had made my way out to Canada’s Maritime Provinces; with my arrival I set two goals for myself: enjoy a traditional lobster dinner, and catch an elusive glimpse of the majestic whale in its natural habitat. With St. John’s in our reach I knew the lobster dinner was not far off; however, the fabled whale sighting proved a more difficult challenge. And so, today we set off on day two of our mission to see a whale. Clarenville Information Centre provided us with the boost we needed, pointing us in the direction of Bay Bulls, a seaside town along the eastern coast of the Avalon Peninsula. 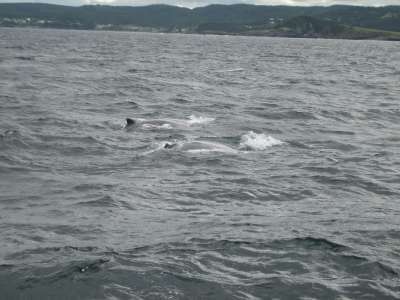 Far larger and more economically developed than Twillingate, Bay Bulls offered organized boat tours of the area with expert guides to highlight the area’s featured sites. With no designated lookout, we were forced to pay for tickets aboard the Gatherall II for the opportunity to catch a glimpse of these grand mammals. Hearing that previous tours that day had had tremendous luck with sightings, and knowing that there were dozens of whales in the area feeding, we eagerly headed out to sea with high hopes. And, in fact, within 10 minutes we saw the first sprays of the day. Our extremely knowledgeable staff took us out past Grand Island and soon we were seeing whale sprays all around us and it wasn’t long before the first fin whale surfaced. The excitement on the boat was palpable as we all rushed to snap photographs hoping to capture a great shot. Within half an hour, as the boat drifted, we were being circled by one pair of fin whales and one pair of humpbacks (a rare breed for this area). 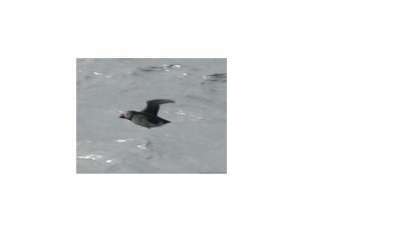 As they circled to cull their food we had many opportunities to see these creatures surface and dive again. Staying down for only about one minute at a time these large animals certainly made their presence known – truly the featured attraction. While I could have stayed out there all day watching them, we were on a schedule and had to head back to shore. However, our tour was not over without passing by another remarkably unique site in the area, the ecological reserve for birds. Comprised of four islands this reserve houses over 5 million birds, including the iconic Puffin. Standing only 8 inches high, the Puffins come to these shores annually to mate, using their colourful bills to attract a mate and then shedding them for the duller gray bill when they are out at sea. One of the islands of the reserve, Gull Island, was our final stop on our way back to Bay Bulls as we watched the thousands of birds covering the shoreline and flying overhead, a truly magnificent site. But alas our wilderness tour ended back at Bay Bulls harbour some 90 minutes after it started. Gatherall’s had provided a truly unique experience which was not only exhilarating and educational, but entertaining as well, with traditional Newfoundland songs and lots of laughter. Having completed one of my goals that day we headed out from Bay Bulls to pick up my dad on the Trans-Canada Highway, and onto St. John’s for dinner to complete my second….yummy. 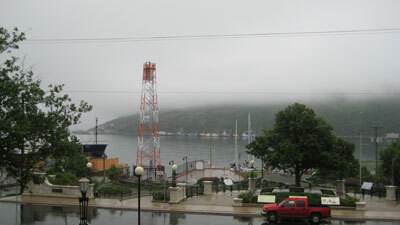 We set out from Avondale in the rain and fog, somehow fitting for Newfoundland. I took the scenic route. OK, I was lost and wound up in Conception Bay South. This lengthened the route somewhat but I regained the highway and headed for St. John’s in the increasing rain. Ahouva and Adi guided me into St. John’s downtown and to the start of the Trans Canada Highway, Mile 0. Today’s ride from Avondale to St. John’s was 53 km. A small crowd was waiting in the cold drizzle for us at Mile 0 with a banner and balloons. They were members of the Newfoundland and Labrador Long Term Pain Association waiting to greet us and they were in good spirits. The Association’s Educational Co-ordinator, Carol Stanley, and Helen Small had organized this reception complete with a snack for one hungry rider. We met each other and photographed and then went to the Marriott Hotel for a conference. PARC educational materials were on display for sale and Helen led a seminar about CRPS essentials. I received a handsome medal from PARC showed a determined cyclist who looked more serious than I, and my wife and Carol Stanley were also honoured with medals for their contributions to the Ride. In the evening we met again for a pleasant meal in the hotel restaurant which had a good view of the fog-shrouded harbour. Almost everyone ate pan-fried cod. From the guests I learned a lot about this province and about chronic pain treatment here. There is limited access to physicians who treat chronic pain. Carol knew of only two anesthesiologists who treat chronic pain part time. There is a long waiting list, lengthened considerably by summer holidays. Family doctors are attempting to fill the void. Emergency departments are not sympathetic to chronic pain patients as a whole. Sound at all familiar? So ends the Ride to Conquer CRPS. I hope this ride has given hope to CRPS sufferers and improved the visibility of this very serious disease in the medical community and with the general public. I wish to thank my wife and daughter for taking care of all the day to day details of the ride, from navigation to accommodation, from dehydration to excess precipitation, from good food to cheery mood. I would like to thank Dr. Pollett and Dr. Bennett for the scientific presentations on CRPS. Finally I wish to thank Carol Stanley, Violette and Deanna and especially Helen Small for the educational and fund-raising aspects of the Ride. We worked well as a team and I believe the results will justify the enormous energy and time commitments of all. It has been my pleasure to be part of this team. We are accepting online donations. Please fill in the form TWICE, once for PARC and one for online donation.